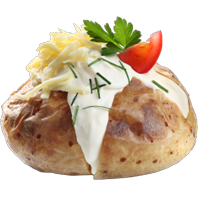 One medium-size potato has just 110 calories and is absolutely fat-free, sodium and cholesterol free, making them downright undeniable for any diet. The power of the potato doesn’t stop there. 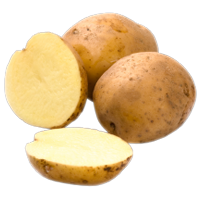 One medium potato with skin is a good source of potassium, providing 620 milligrams or 18% of the recommended daily value (DV) per serving. 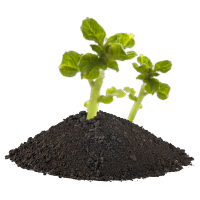 Potatoes rank highest for potassium content among the top 20 most frequently consumed raw vegetables and fruits. Potassium is a mineral that is part of every body cell. It helps regulate fluids and mineral balance in and out of cells and in doing so, helps maintain normal blood pressure. Potassium is also vital for transmitting nerve impulses or signals, and in helping muscles contract. Potassium is a powerful dietary factor that may help lower blood pressure. Unfortunately, few Americans are getting the recommended 4700 milligrams per day of potassium they need. Potatoes are an excellent source of vitamin C (45% of the DV), which is more vitamin C than one medium tomato (40% DV) or sweet potato (30% DV). Vitamin C is a water-soluble vitamin that acts as an antioxidant stabilizing free radicals, thus helping prevent cellular damage. It aids in collagen production; assists with iron absorption; and helps heal wounds and keep your gums healthy. Vitamin C may help support the body’s immune system. 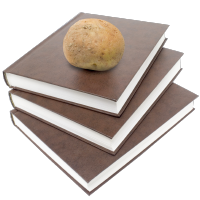 One medium potato with the skin contributes 2 grams of fiber or 8% of the daily value per serving. Dietary fiber is a complex carbohydrate and is the part of the plant material that cannot be digested and absorbed in the bloodstream. Soluble fiber may help with weight loss as it makes you feel full longer, and research has shown it also may help lower blood cholesterol. 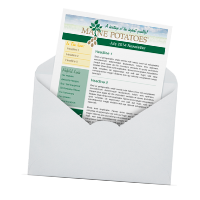 Potatoes are a good source of vitamin B6 with one medium potato providing 10% of the recommended daily value. Vitamin B6 is a water-soluble vitamin that plays important roles in carbohydrate and protein metabolism. It helps the body make nonessential amino acids needed to make various body proteins; it is a cofactor for several co-enzymes involved in energy metabolism; and is required for the synthesis of hemoglobin – an essential component of red blood cells. 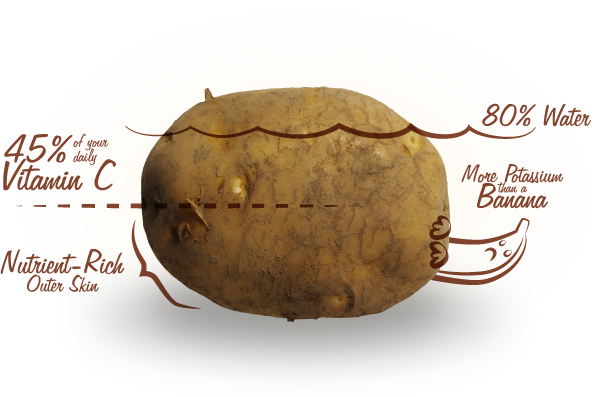 One medium potato provides 6% of the recommended daily value of iron. Iron is a major component of hemoglobin that carries oxygen to all parts of the body. Iron also has a critical role within cells assisting in oxygen utilization, enzymatic systems, especially for neural development, and overall cell function everywhere in the body. Thus, iron deficiency affects all body functions, not only through anemia, which appears late in the process of tissue iron deficits.